Both Maya & Pierson know the turnaround and spin commands (one is spin clockwise and the other is spin counter-clockwise). It is a useless dog trick but a cute one. 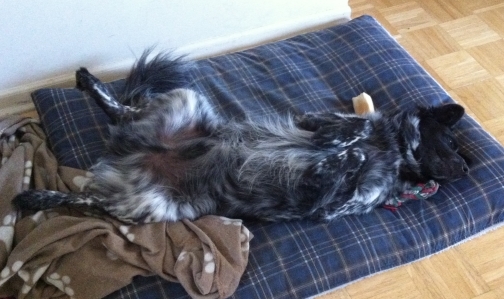 What sort of cute tricks does your dog do? Maya does the spin dog trick. Pierson does the spin dog trick. Can I get them to do the spin dog trick at the same time? Yay! Maya & Pierson have mastered synchronized spinning! For some reason, it is easier to get them to do the spin trick clockwise rather than counter-clockwise. 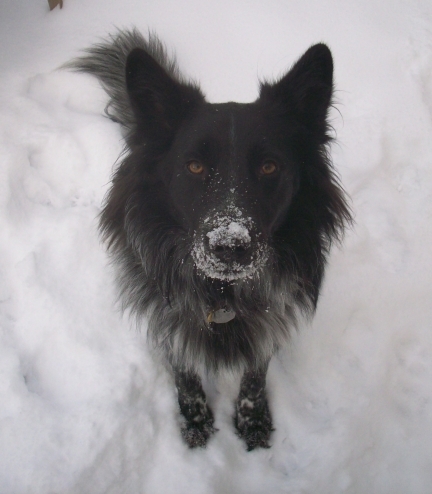 For other great pet photos, visit the Wordless Wednesday blog hop below. How Do We Support Animal Welfare? The biggest way that we support animal welfare is by being selective about the kinds of foods and products we buy. For instance, we only buy cage-free humanely raised chicken and eggs. If we buy other meats such as beef or pork, we carefully select by the same method as with chicken. We don’t buy cow milk, we buy almond milk. Other dairies such as cottage cheese, sour cream, etc. are a little more difficult and very expensive to get as humanely raised so we limit this stuff as much as possible. We are also careful about the hygiene products we buy, although I am not as well educated in this matter as others might be. 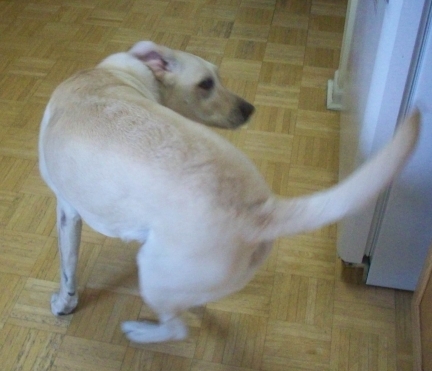 It is not as easy to find dog food made from humanely raised meat. When it is more readily available and not too expensive for us, we will definitely switch. Another way I support animal welfare is by talking about my dogs. By talking about them, where I got them and how I raise them, I am indirectly educating people about the importance of proper pet care. I do it indirectly because people don’t like it when they are told that they are doing something that might be considered wrong (or not doing as well as they could). They are more apt to listen if they are presented with information in a positive way and nothing is more positive than talking about Maya and Pierson. When I talk about Maya and Pierson, the main question that people ask is where I got them. Maya is a purebred so I think many people assume I got her from a breeder. And Pierson is so exotic-looking that some people think he is a designer breed. Whether Maya originally came from a breeder or not is unknown. I adopted her. 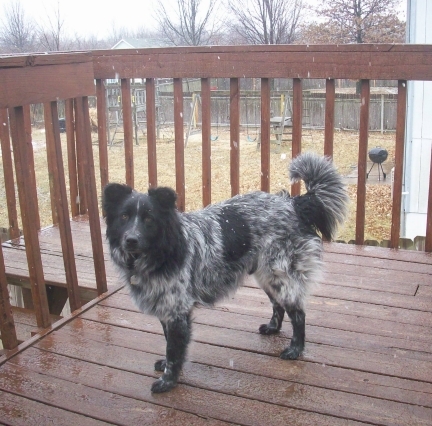 Whether Pierson was an attempt at a designer dog or just an accidental farm dog is also unknown. I rescued him. I have never purchased a dog in my life unless you count adoption fees. I also talk about how I care for Maya and Pierson. They eat healthy food, they are indoor dogs, and they are trained mostly using positive reinforcement. I also brush their teeth, clip their nails, and make sure they visit the vet annually and as needed. I also have them wear their tags and they are microchipped. Oh yeah, they are also spayed and neutered. We also support animal welfare groups such as the World Wildlife Fund, Humane Society of the United States, the ASPCA, and our local animal shelter. We will occasionally support smaller and more local groups, but as Rumpy pointed out it can sometimes be difficult to tell how much the smaller groups are really helping. There are probably other ways that our family helps, but I can’t think of any more at the moment. 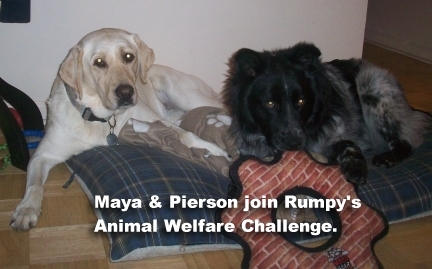 Thank you, Rumpy for inviting us to this challenge. Have a wonderful Monday! 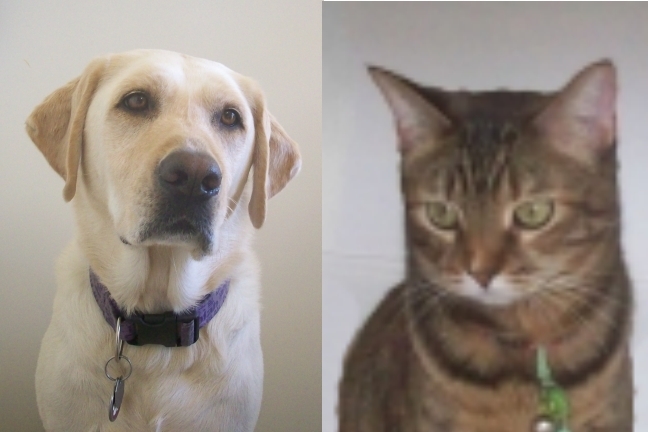 In Part I of Dogs vs Cats, we compared the two. But now, let’s have dogs and cats decide among themselves which is better. But wait! It looks like the dog’s got this cat in hand. The dog thinks this is a fun game while the cat is not at all happy about it. Poor kitty! It looks like it is still a toss-up. Perhaps if we watch this funny pet video we can decide which is the funniest, dogs or cats? So who wins? I think we have a tie! For more fun pet stuff on Wordless Wednesday, visit our other blog, PetAutoSafetyBlog. Here we have some funny Subaru commercials. Also, check out the blog hop below. 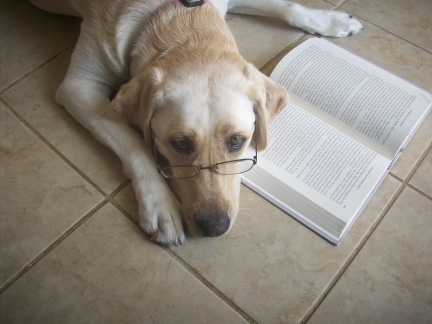 I read this great article on Hub Pages about why dogs are better than cats. You can read it HERE. And it reminded me of a couple of videos I have seen regarding the same dog and cat rivalry. I absolutely LOVE this video showing why cats are better than dogs. This next video tries to show why dogs are better than cats. I wish someone would make a video as funny as the previous one. If people acted like dogs or cats, this video shows what they would be like. Personally, these people give me the creeps. I’d rather have the personalities in furry forms than in people forms. This one isn’t a dogs vs cats video but I just saw it Thursday and have to share because it’s so cute. Can your cat do that? I think not. I have had both dogs and cats but overall, I prefer dogs. 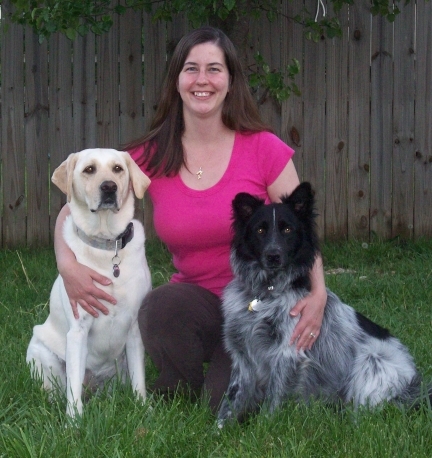 I currently have two dogs, Maya and Pierson. 1. Because I have two hands. 2. So they can play with each other. 3. So one can keep my feet warm while the other can keep my lap warm. 4. Because I need more than one morning wake-up call. 5. So no matter what color of clothes I wear, you can tell I have a dog. 6. As a double-backup burglar alarm system. 7. So I get a strength workout on both arms while walking. 8. So I can have twice as much fun. 9. So I can have both slippers brought to me at the same time instead of one at a time. Do you prefer dogs or cats (or other)? What are the special things about your pet(s)? Sweet, sweet Heather lost her owner to cancer. She is the talk of the doggie park. Full of life and charm. She loves her daily trips to the park and gets along with everyone. 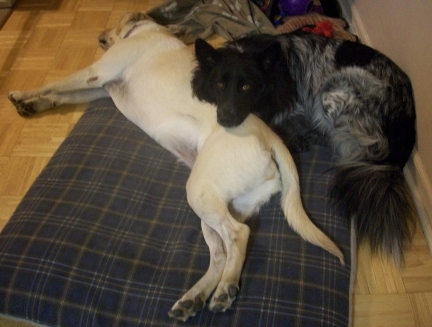 She plays with her foster brother and lets him know that she is the senior in the pack. She has an instant alarm clock and will give out a short woof when it is time to get up. She loves her two cat mates and enjoys playing with her squeaky toys. Heather has a beautiful coat and is so willing to please. She is on a green bean diet to take off some weight but with the exercise plan she is on will have the weight off in no time. To see more on Heather Samantha, visit Petfinder.com – http://www.petfinder.com/petdetail/24932111. Eunice is a sweet girl who looks older than she is. She was rescued from a local shelter and is a wonderful, gentle giant. She is good with other dogs, but needs a home without cats. Eunice prefers to spend her time just lounging around. She is a true couch potato. Eunice is around 3 years old and is a big girl weighing over 96 pounds. Eunice came in with some skin issues, probably from fleas. 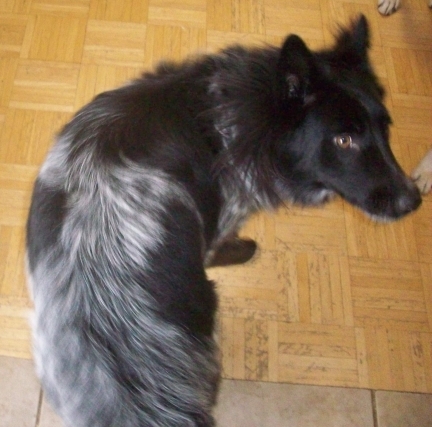 With a good diet and some tlc, she will have a beautiful coat in no time! For more on Eunice, visit her profile page on Petfinder.com – http://www.petfinder.com/petdetail/24647351. 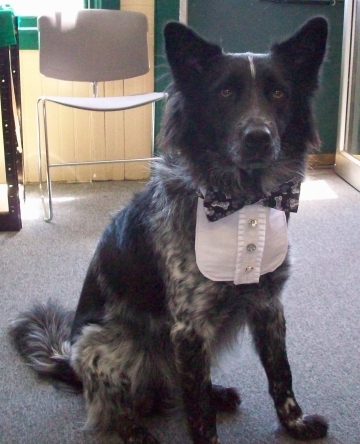 Domino is a handsome guy with deep chocolate brown eyes. A real sweet heart this guy loves his people and is very happy being an only dog. He has on occasion gotten along with other dogs, but we feel it would be best for him to be an only child. He’s a big guy who isn’t going to stay put in an unfenced yard and when he gets out, small animals including cats are not safe around him. For more information about Domino visit him on Petfinder.com – http://www.petfinder.com/petdetail/23230665. Layla is an Olde English Bulldogge. We were asked to take Layla in because she was too much for her family to handle. She is around 60 pounds and about 1 year old. She is a very large puppy! She loves to play and will need exercise and love! To learn more about Layla, visit her page on Petfinder.com – http://www.petfinder.com/petdetail/23795650. Click this image to find out more about this great event! Vet and Nurse Maya have confirmed Pierson has no underlying health issues that caused his seizure last week. 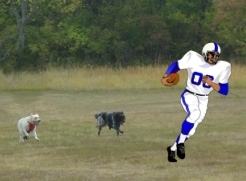 Maya & Pierson tackling football player for Super Dog Sunday. 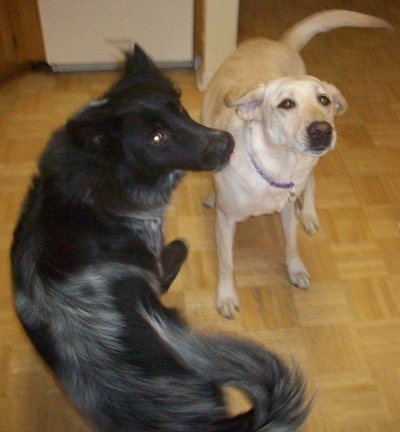 We have more Super Dog Sunday photos of Maya and Pierson at our Pet Auto Safety Blog. Happy Wordless Wednesday! When I was living as a stray. And I am one happy guy. But I didn’t know her and wasn’t sure if I wanted to go. First there was a flea and tick bath, then the vet. Then there was another person and a dog I had never met. But I soon realized these people really cared. I knew they would never leave me behind. It didn’t take long to build up the trust. Life here is so happy and just. I get lots of love and delicious food every day. I’ve learned snow doesn’t mean cold, it means fun to play. I have real dog toys and meaty bones too. Mom likes to teach me tricks and I love to learn. I have everything now and nothing to yearn. This is my forever home, the best place to be. So now I celebrate, Happy Gotcha Day to me! 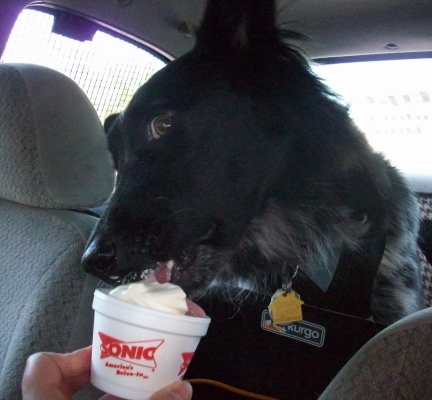 For more Wordless Wednesday pet photos and fun, visit our other blog, Pet Auto Safety Blog. 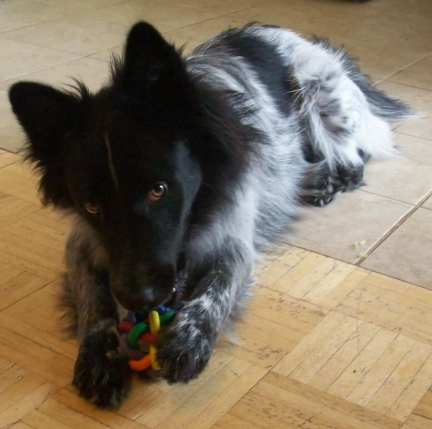 We’ll share photos of a cat named Mau and photos from the other dog blog hop participants. We recently had some articles about how to get your dogs to take their medication, but what about cats? Here is a helpful guest post for those of you who have cats too. 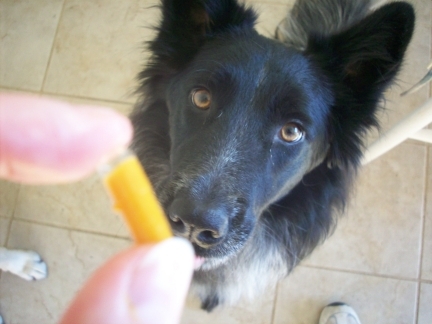 There is nothing as difficult as forcing a pet to take his or her medicine. They will claw and bite their way out just to avoid the medicine. At one time or another, you have been forced to do it because unless the pet takes their medicine, they might end up getting really sick. Cats are a prime example of how difficult it is to give them their medicine. While this is a very difficult process to undertake, there are some ways that you can employ to ensure that your cat gets the medication that he or she needs. The following are some of the tips that you can employ for pet cat medication. The first method you can employ when giving your feline his or her medicine is to hide the pill in his or her food. Cats like dogs have a very strong sense of smell and are able to detect something amiss in their food from a mile away. So then how do you cloak the pill so that they don’t get wind of it? Well, you can make an incision in a piece of meat or tuna and hide the piece of meat inside. You should make sure that you target when the cat is at his or her hungriest. Then you can be assured that the cat will gobble the food down as quickly as possible without realizing that the medicine was there. However, this method is tricky in that sometimes the cat will sense the medicine after they have ingested the food and will try to spit it out. 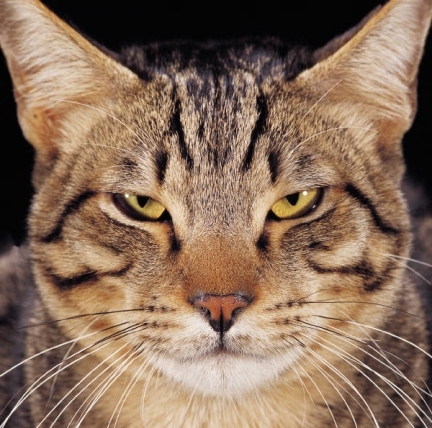 Hence, it is recommended that you monitor your cat closely so that you ensure that they have taken their medicine. 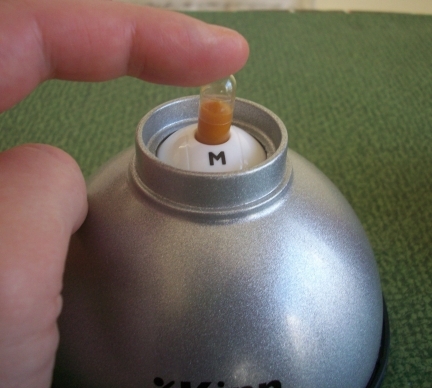 Another method of ensuring that your cat takes his or her pills or capsule is to force it down. This method is especially delicate considering that it might result in a lot biting and scratching and will require two people in order for it be successful. Most vets will tell you that in order to force feed a cat a pill, you first hold it behind the head. You then make sure that you squeeze the lower jaw gently with your thumb and index finger and your compatriot should give the cat the tablet or capsule. You should then close the jaw until you see that the cat has swallowed the medicine. It is very important that you bind you cat’s legs or have your friend hold them for you. Most vets will use a pill gun. 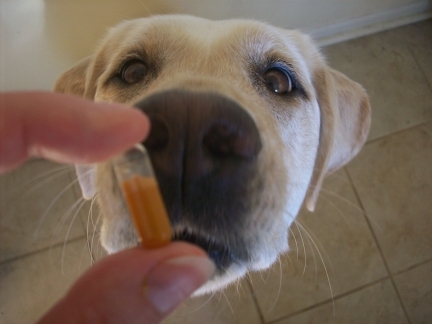 They usually say that it is the easiest method of ensuring that your pets take their medicine. Pill guns are available in any pet store. However you should ensure that you use it properly lest you end up injuring your cat. The above are methods you can use to ensure that cats take their pills and capsules. When it comes to liquid medicines, you can use a syringe or a drenching gun to administer the liquid medication orally. A hypodermic needle can is used for medicines that require invasive administration. However, you should leave this method to the vets. 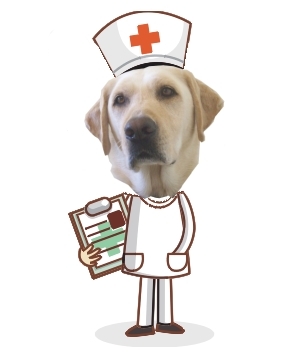 This is guest article provided by Vet-Medic, an online pharmacy store offering wide range of pet products and unlike other online stores you can also talk live to certified veterinary surgeon and pharmacists. The Kinn Kudose pill concealer base, bottle with apple/chicken baby food in it, and pill casings that will disintegrate when your dog eats it. I recently had the opportunity to try out the Kinn Kudose pill concealer. When I first saw the product online I was a bit put off by the price. But when I got it in the mail I was pleasantly surprised. This isn’t some cheap flimsy product. It is very well made. And if you are medicating pets regularly, it is very useful. At first I had a difficult time with it. One of the recipes it suggested was a peanut butter with oil recipe. It calls for smooth peanut butter and that is what I used. But I used Smucker’s Natural Peanut butter which is just peanuts and salt, no sugar or other additives. Even though it was the smooth variety, this particular brand was not as smooth as the peanut butters which have additives. So when I tried to squeeze it out of the Kudose bottle, it wouldn’t work. I guess the peanut chunks were too big and got stuck in the nozzle. So I went and bought some baby food, which was another recipe Kudose suggested. It suggested chicken and gravy but I ended up buying sweet potato with turkey and apple with chicken. These worked very well and squeezed right out of the bottle. In fact, it came out so easily that the first pill I made was overfilled and I made a mess. But after making a couple more, I was able to make them quickly and easily. 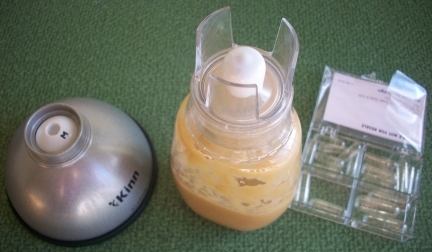 The Kinn Kudose pill concealer with a pill case in it, the bottle on top, and sweet potato/turkey baby food being put inside. Maya takes medication on occasion. I hate it when I try to hide the pill in soft cheese and she still manages to spit it out. Sometimes I would just skip the pleasantries and drop the pill in the back of her throat and close her mouth to make her swallow it. Not fun, but at least she ate her medication. But with the Kinn Kudose pill concealer, medicating Maya is 100x easier. 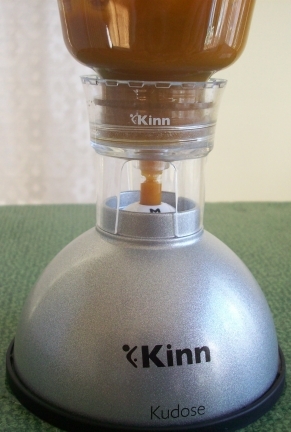 While the initial cost of getting the Kinn Kudose base dome and bottles might be considered pricy, it is a onetime cost and well worth it. The only other thing you would have to buy afterwards is more pill cases. These cases are just under $5 for over 100 of them. 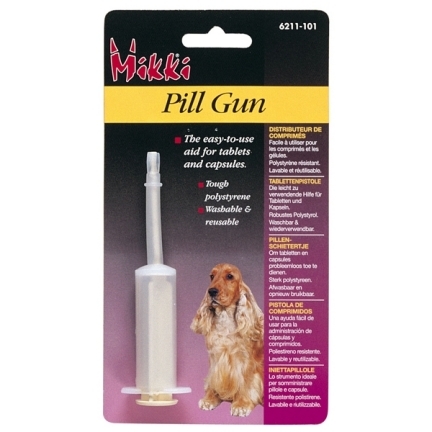 The pill cases dissolve quickly so that the goodies and medicine you are putting inside gets digested by your dog. So you will want to make a pill as needed, not in batches. Simply open the empty pill casing and put the larger piece in the proper slot of the Kinn Kudose base. Put the medication in the casing. Then take the bottle of whatever goodie recipe you decide to use and set it directly over the pill casing onto the base. The attachment on the bottle makes it very easy to just simply set it and fit it over the top. Squeeze gently until the pill case is full, take the bottle away, then take the other piece of the pill casing and place it over the top. After medicine is put in the pill and it is filled with the treat (in this case it is sweet potato/turkey baby food), put the pill together. Ta da! In no time at all and no mess, you have a delicious tasting pill. Both my dogs gobbled it up! Pierson really wants the pill from with the apple/chicken baby food in it. Maya really wants to try a pill from Kinn Kudose with sweet potato/turkey in it. No meds this time, just a treat. For more information about Kinn Kudose, visit their website, Kinninc.com. They also have a pill splitter/crusher so that you can break pills in half or crush them for mixing.